↑ 1.0 1.1 1.2 1.3 1.4 Central Intelligence Agency. "Uruguay". The World Factbook. Retrieved 5 January 2010. 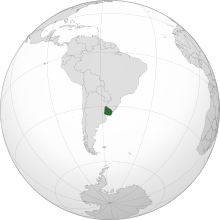 ↑ 3.0 3.1 3.2 3.3 "Uruguay". International Monetary Fund. Retrieved 2012-04-22. ↑ "Uruguay". Encyclopædia Britannica, Inc. 2008. Retrieved 2008-09-02. ↑ "Ministerio de Turismo y Deporte del Uruguay (Spanish, English and Portuguese)". Turismo.gub.uy. Retrieved 2010-06-26. ↑ "Censos 2011 – Instituto Nacional de Estadistica". Instituto Nacional de Estadística. Retrieved 13 January 2012.